The story of Mountain McClintock, a punch-drunk fighter past his prime; a trusting soul whose innocence proves his undoing after those closest to him sell him out. Torn between betraying his moral code and saving his manager, Mountain must find a way to move forward with the one thing he has left - his pride. The Artistic Home will be re-creating the intimacy and intensity Rod Serling's story originally had as a live television drama. The first Chicago production in ten years will take a new look at our nation's history of toxic capitalism that twists the American Dream and allows us to sell ourselves down the river by believing our own violent lies. "...Serling (The Twilight Zone) was admittedly a machine when it came to plot. But if the idea that McClintock's move from boxer to wrestler constitutes an utter fall from grace is a tad on the well-made play side, the show itself is still�ugh, cue the Rocky theme�a knockout." "...There is nothing dated about the production; although the ambience is immediately redolent of a time and a place, cleverly called forth with accents applied to dialogue, the effect is timeless, the emotions of Everytime and Everyplace. The tale portrayed is heartbreaking and yet uplifting; tautly and unsparingly directed by Mossman, it will wring you dry with pathos, make you smile with its innocence, and send you home with a sense of honor palpating in your breast. All of the characters are presented as caricatures of themselves and yet endearingly human, whether smarmy and hateful, washed-up and pitiful, a boozy stumblebum, a virginal almost-willing lover, or a malevolent gangster." "...�There�s eight champions in this business. Everyone else is an also-ran.� Requiem for a Heavyweight is Rod Serling�s ode to the also-rans and an indictment of the world that creates them. Though the overstuffed stage script starts wearing at the seams at times, the intimate Artistic Home space serves the material well in this revival, and Mark Pracht as washed up fighter Mountain McClintock bares the heart of lost man-child trying to hang onto his pride. A talented and committed cast captures the seedy world that Serling envisioned and director John Mossman deftly employs the rhythms of the boxing world to propel the story to a surprisingly satisfying ending." "...But for its excesses, this is worth seeing and not just for the gritty atmospherics and chemistry between Pracht and Hogan. 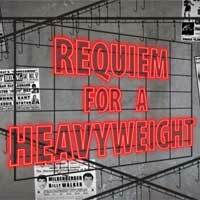 While �Requiem for a Heavyweight� is as pure a product of the fifties as tail fins or poodle skirts, it speaks to today. In a dog-eat-dog world, Maish�s smooth line and bogus self-assurance comfort Mountain, the over-the-hill boxer who still answers to �Kid.� By treating Maish as a father figure and accepting his manipulations, Mountain prolongs his childhood and avoids the angst that comes with standing on one�s own two feet. �Requiem� reminds us that, whether dealing with a two-timing manager or a lying demagogue and swamp-like system, freedom starts with the resolution to grow up and see things as they are." "...It's a good story with a great cast. I think it just goes on for about half an hour too long for me. That said, stories of someone reckoning with the end of their career and dealing with the fallout of learning the people they love are not who they seem to be are timeless for a reason. On the strength of this cast alone, this show is worth your time." "...Putting such a teleplay onto the stage is transformative for the work. The audience is not limited to the camera�s viewpoint, but it tests the writing and of course, the performances. We can report that Artistic Theater�s production is absolutely first rate � first and foremost because it is very well cast, with a staggeringly good performance by Mark Pracht as Harlan �Mountain� McClintock. Pracht seems born for this role, as he is both a mountain of a man, and carefully expresses Serling's portrait of a Tennessee country boy who has taken way too many punches." "...That person is played by Mark Pracht, a storefront-circuit regular whose bulky, six-foot-plus appearance has awarded him a number of amiable leading man roles in the past, but here is so wholly transformed as to be barely recognizable. The presence inherent in actors who take up copious visual space in studio-sized auditoriums like the Artistic Home's is still in evidence, but Pracht's skill set now includes nuance, both verbal and physical, enhanced by a physique thirty or more pounds leaner than before, making the most of hitherto-masked facial and body language. The result is a star-making performance sure to herald its perpetrator's entrance to the major leagues."